Tips and guidelines on selecting the impact of your health score factors. After you have chosen several factors that will affect your health score, it is time to get them set up in the health profile. You have several options when choosing how much each factor will affect your overall health score. ‘Hard’ Conditions: these conditions that will add or subtract the same amount based on the parameters you set. example: the NPS score is “less than” 6, the health impact = -3. 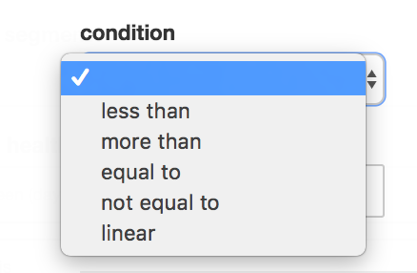 However, if you would like a sliding scale for your health score, you can select the linear condition. example: the NPS score is between 0-10, the health impact = -5 (if it is a score of 0) / +5 (if it is a score of 10). So… if the NPS score is a 0 the customer gets -5 points. If the NPS score is 10 the customer gets +5 points. If the NPS score is 7 the customer receives +2 points.